Congratulations on your decision to investigate on laser vision correction (LVC). Choosing a qualified surgeon and the centre is a difficult process in itself, but for many simply making the decision to undergo laser vision correction is a huge step. With the latest advances in Excimer Lasers and surgical procedures there are several other options available to correct vision problems as well. The important thing is to find the procedure that is best suited for each individual based on his or her lifestyle and visual needs. There are two fundamental surgical procedures for laser vision correction. One is LASIK, which stands for Laser Insitu Keratomileusis, and the other is PRK, which stands for Photo Refractive Keratectomy. With LASIK, a thin flap is created in the front portion of the cornea with a special laser called the femtosecond laser. 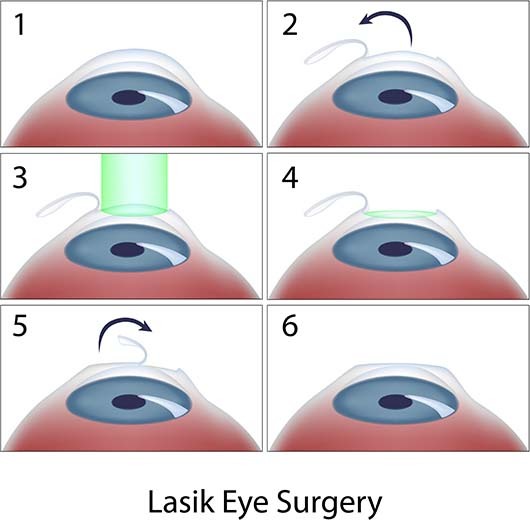 The flap is then lifted and a second laser known as an excimer laser, which is controlled by a sophisticated software on a computer, is applied on the remaining cornea to precisely sculpt a new shape, either decreasing the curvature of the cornea to correct nearsightedness (myopia) or increasing the curvature of the cornea to correct farsightedness (hypermetropia). The reshaped cornea allows the light rays to focus more accurately on the retina. With PRK laser surface ablation the laser reshaping is applied on the surface of the cornea without performing a flap. Instead, the outermost layer of the cornea called the epithelium is removed mechanically or with a laser. A computerised laser is applied on the cornea with accurate precision to reshape it. Following the procedure a contact lens is applied to the surface of the cornea, which acts like a bandage promoting healing and improving the comfort of the eye. To create a map of the eyes optical system, flat lightwaves are passed through the entire eye and the reflected back to a wavefront-measuring device. This device then converts the reflected light in to a 3D map representing your eyes unique visual distortions. 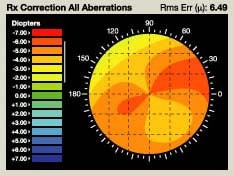 Wavefront analysis works by measuring the distortion or irregularities of the eye, known as higher-order aberrations. Because each patient has a unique visual optical system, the wavefront data has been likened to a fingerprint. Recent advances in laser vision correction include Femto LASIK (bladeless LASIK). A precise, thin flap is created in the front portion of the cornea using a specialised femtosecond laser instead of the traditional microkeratome (blade). Small laser bubbles are created by the femtosecond laser creating a dissection plane enabling the surgeon to lift the flap. 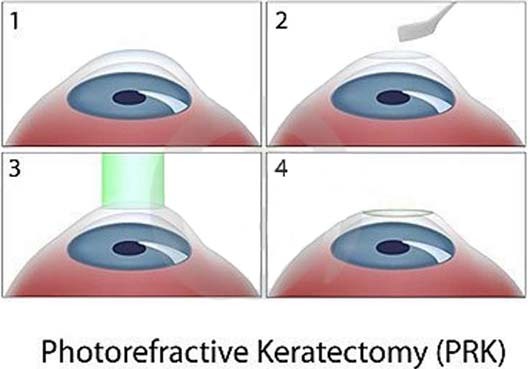 Femto LASIK has the same if not better visual results as conventional LASIK, but offers increased safety during flap cutting by improved corneal biomechanical power due to precise thin flap that leaves the underlying cornea intact. At Ayrshire Eye Clinic, we use the most advanced technology for laser vision correction for all our patients. All LASIK procedures are done with a Zeimer femtosecond laser and a wavefront guided excimer laser treatment with advanced Customvue software.